As you have heard repeatedly on the news, banks have cut back their lending sharply since the credit crisis began. 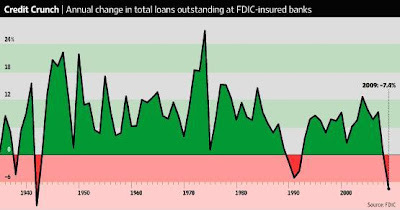 In fact, as the chart shows below, lending fell last year to its lowest since 1942. So what are banks doing with all their deposits if they are not lending? Ah, now that is the question that is never discussed. It is not that banks are not lending, they are just not lending to consumers or businesses. They are, however, lending to the Federal government. Since March 2008 bank lending has declined by 220 billion. During that period they have purchased an additional $337 billion in government debt. The reduction in bank lending does not mean the money supply is shrinking, it just means it is being diverted toward government spending instead of private sector growth.